A few weeks ago I wrote about one of three types of crazy that the artist is familiar with. I called it mild insanity. In that case, I talked about how the shift in priorities that allows her to create art makes her look seem out of balance to the rest of the world. The second in the theme steps it up a bit. It is the craziness that drives the artist to finish the big ideas when everyone else would see no use. To make the big dreams real, we have to believe they really matter, often when no one else believes it quite as much. Like any oddity, the insanity varies from mild to extreme. Some ideas might even be so good that friends and rich investors stand behind the creator from the start. But at some point, maybe even for only a moment, anyone who gets a big idea and does something about it has to jump into this dare to believe. There's that moment when I have to tell my wife about the idea-the one that would impact thousands of people for good-that seemed good at 11:00 the night before or that I thought of when I was half dreaming that morning. "Normal" people, it would seem, do not do this. They wake up thinking of ways to fix the lawn mower or how the new kitchen should look. At least those are the plans they share with me. Maybe they're not comfortable being that crazy around me. I am very familiar with this crazy. My dedication to an idea is often obsessive. I usually believe immediately it's going to change the world, make me (mildly) rich. or at least achieve the better than nothing stamp of "critical acclaim". I can go a few months like this, tearing into some new idea in a hobby I am barely familiar with. I did it with games for years. Good and bad ideas floated across the playtest table week after week, but I was driven by the overall crazy notion that I was meant to make games. I could tell stories from childhood to support this. And all those years when I didn't even know it, but the dream was there. I just knew it. For me it was a sense that I had something to give and I was supposed to make it real. It's like this messiah complex. Bono talks about it a lot. (“Anyone who finds their way to the front of a rock band… has definitely got a messianic complex.”) It drives him and (at least in cases like his) the success drives the idea. At the heart of this type of crazy is a fundamental of true art - the fact that it might not work. A sure thing is not art. Still, these crazy artists, myself included, believe at times that they see the sure thing when no one else does. It is not just craziness, but the embracing of the craziness. We choose it, return to it and rest in it when everyone else says it isn't worth it. The delusions fade in time, at least for me, throughout the process of work. There are times I keep going because I believe. Then there are times I keep going because I told my wife I'd have it done by May or I've put a year into it. And there are times when the delusion is completely gone. In the flood of reality the idea and, in logical order, the artist himself, looks undeniably childish. Were we fools to believe? And that can be one step toward the third type of insanity. I'll come back to that in time. But the good and terrible thing of this delusional vision of the artist is that sometimes they are right. They aren't always right. Oh, I played some terrible games from people who were sure they had discovered gold. I hated to hear the stories of garages filled with unsold boxes. Sometimes the crazy is just crazy, but sometimes it's what someone was supposed to see. They had to see it. If there's a way to know the difference we haven't found it yet. As much as I hate falling for the lie in some of my ideas, if we ever find the formula for success we will destroy the art. I came across this quote while searching for quotes from artists last week. I posted parts of this process last week, but this is the full tutorial I created for a session I prepared for teachers. It shows how to make a narrated video slideshow whether using a laptop or an iOS device. It works great for many types of presentations. With some simple image editing, this makes a great way to present an original poem. 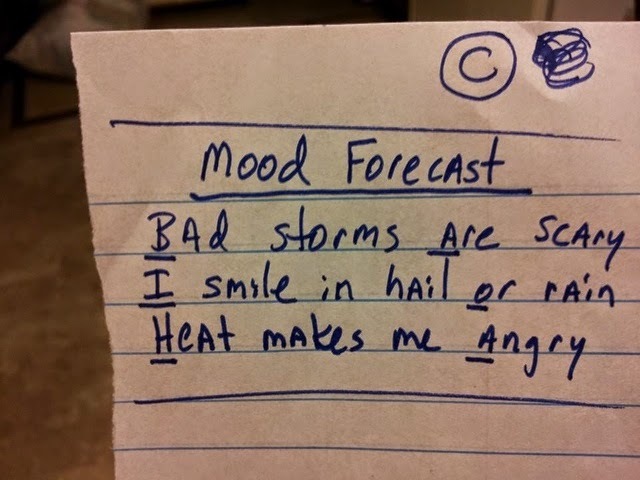 Both of these examples are of a haiku I wrote for this project (while watching some nice weather pass me by as I worked!). I took the pictures on my iPad and edited them in Pixlr Express. For this first example I used GarageBand on the iPad to create a simple song with my narration of the haiku. I exported that to iMovie and compiled the edited images using that app. For this second version I used Videolicious on the iPad. My wife narrated it this time and the music is a song that comes with that app. iMovie or Videolicious if using an iOS device for making the video - iMovie is best, but might cost $4.99. Videolicious is a great free option for videos under one minute. 1) Write the narration or poem that you'll read. If you will have a lot of talking and you don't want to write out every line, be sure you have a good outline to follow. 2) Take the pictures that you will use in your slideshow. These can be of anything that fits your material, including pictures of drawings that you make. 3) Optional: If you want to edit your photos, it is suggested you use the Pixlr Express app. The remaining part of the process depends on the device(s) you have and the apps or programs you can use. Using iMovie on an iPad - This is an excellent option, but if iMovie costs $4.99 you might opt for the process using Videolicious below. Record your narration with GarageBand as an Audio Recording track. This first video gives a good overview of the process. See the notes below the video to address possible additions or differences between this video example and your project. Use the trim or Split/Delete features shown in the video to cut out any mistakes if necessary. You can add music tracks as shown for additional background, but consider using Smart Instruments instead. Strumming the guitar chords or adding some strings is an easy option. See my first video above as an example of how this might sound. After you make this recording, don't upload to SoundCloud as shown in the tutorial. Instead, you'll export it to iMovie as explained in the steps below. Follow the steps in the this tutorial, but you will not start by exporting the song from GarageBand. Instead, just open iMovie and create a new Movie Project. Since you won't have narration to follow yet, you will have to guess how long to make each picture, but you can change them to fit the narration later as necessary. After you get all the pictures how you want them, do not export to the camera roll as shown. Instead, follow the directions beneath the tutorial below. Regardless of whether you made your narration or music in GarageBand, add your images and set the timings as shown in this tutorial. After adding your pictures and setting length, pan/zoom and transitions, move to the beginning of your video in the timeline. Tap on the microphone icon in the lower right corner. It will open up the record options. Tap Record and read/speak the narration for your video. When you're done, tap on Stop. You can then replay it, record another take or accept it. Repeat the record process until you have a take you're happy with. Tap the Audio tab in the upper right and you'll see options for music from your iPad and preset music based on the themes. Choose one that you like. If you tap the song track in the timeline it will give you some options for volume and speed. When you are happy with your recording, export to the Camera Roll as shown at the end of the video tutorial above. Using Videolicious on the iPad - Videolicious is a great app that strikes a balance between ease of editing and some control. It is limited to a one minute video, so this won't be a good option if your list of advice or tips is longer than that. This is a tutorial I created for a different type of slideshow and it uses a previous version of the app, but all the steps are the same. Using a computer to create your slideshow - With either a PC or a Mac you can use free software to make the entire slideshow. Then once you have the pictures on your computer, follow the tutorials below depending on if you have a PC or a Mac. If you are using a PC, Windows Live Movie Maker is a good option for a simple narrated slideshow. I created this tutorial to show the basic steps. See additional notes below the video. If you double click the narration track or music track you'll see an option in the upper left to set the volume. Adjust that as necessary. You can adjust the duration of the pictures before or after you record your narration. You might find after recording that some have to be longer or shorter so the pictures change at the right time. If you have a Mac, iMovie is a great free option for making narrated slideshows. This video tutorial (created by some very helpful user) shows almost everything you need to know to create a slideshow. See the notes below for a few other important steps. Before adding narration or music, add the Ken Burns effect for the pan/zoom feature that adds movement to your video. To get to this feature, double click the Crop icon on a clip as shown in the tutorial. Then follow the steps below. A) Click on Ken Burns. B) Move the corners of the Start and End box to indicate where you want the view to start and end when the clip plays. C) Click the Preview icon to watch it. Repeat step B until you're happy with the pan and zoom of the clip, then click Done. Next, record your narration. It is simple to record right in iMovie. Just click the microphone icon (A) and follow the on screen information (B). Include as many group members as possible in your narration. Finally, you need to export your video. Go to the Share menu and choose Export Movie. Select the Large option. I was so tired from a day's work and another evening of preparing for a conference that I nearly forgot about the blog. All I can think for now is to let this slide sum it up. One of these days I'll elaborate. This has been a popular post on this blog! Unfortunately I haven't updated it recently and Pixlr Express has been updated. I'm not sure how accurate the directions below are. If you are interested in the process I now use for making comics from real life photos, see my ebook Creating Comics with G Suite Apps. It is $3 from Teachers Pay Teachers. Pixlr Express can still be used for this activity, but they recently updated the app.e menus are different now, so the pictures below aren't exactly what you'll see. Also, if you're interested in using the iPad for comics, see this post on my other blog for how to make comics with Google Slides. This tutorial was designed for a specific assignment. Learners would create a comic that communicated tips or advice for success. Ideally I like to make comics using Google Drawings, but there's no doubt Pixlr Express is a great free app that works for any device. It can be found online here and with links to the mobile apps. It will get the job done for a good comic formed from photos. 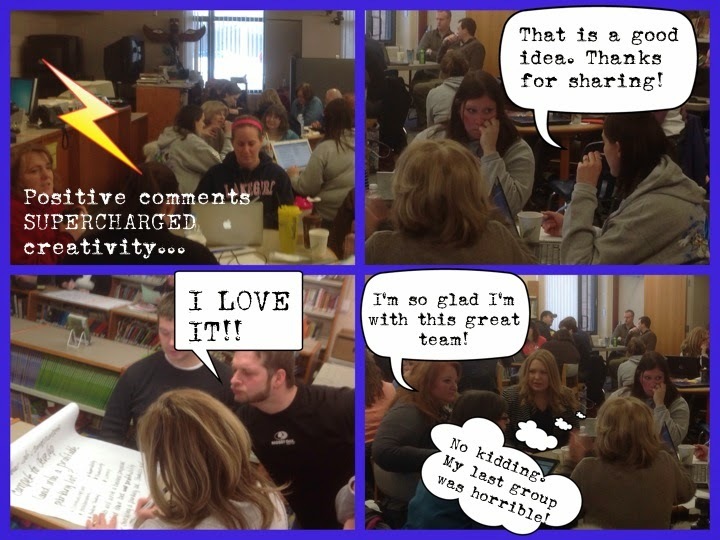 Here's an example I created from pictures I took on a PD day at our school. 1) First you will make the layout using the Collage feature. 2) Choose a layout first. It's suggested you only put 3 or 4 images in each collage (essentially you are creating just a page at a time, not necessarily your entire comic as one picture). 3) Tap in each square of the layout to fill them with your chosen pictures. Zoom and position each as necessary. Use the other tools to set the background color, proportions and borders as you like. 3) Select Finish in the upper right when it looks how you want it. 4) Just to avoid having to start over on the layout due to editing mistakes, save it using the Save options in the upper right. Save as Current Size. 5) Now you will add speech or thought bubbles to each frame. Go into the Stickers menu and select the Comic stickers. It will have to download the first time you select it. 6) Scroll through the Comic stickers until you find the different word or thought bubbles. When you pick one, it will appear on your picture. Move and resize it as necessary. Be sure to make it large enough to hold the text you will put in it. Tap Apply when it's positioned how you want it. Once you tap Apply the only way to change it is with the Undo button. Be sure you're happy with it before moving on to the next one. Repeat for all bubbles in your comic. Type your text. Keep it brief so it will fit in the bubbles. Change the color as necessary. Resize it and position it. Repeat for each bubble, caption or title on that page. 8) When all the bubbles and text are done, save the image by tapping Save in the upper right. To make sure the image is not too large, choose the resize option. Pick the one that's close to 720 x 540. 9) Repeat the steps for another page as necessary until all your frames are done. 10) Ideally you need to get all those pages into a single PDF. If there's any way you can use a computer for the final step, import the page images in order into a Google Document and download as PDF. In preparing for my presentation this weekend, I compiled some quotes from artists. Some are favorites I came across before, but most were new to me. 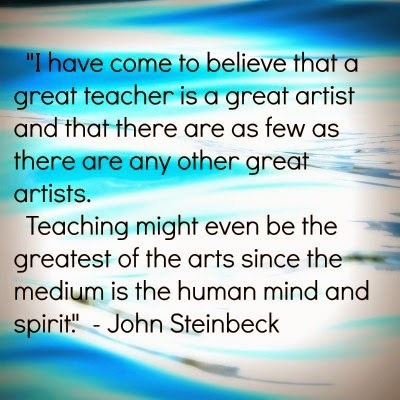 The quotes relate to the aspects of teaching like an artist that I have highlighted throughout previous posts. "Talent is cheaper than table salt. from the successful one is a lot of hard work." and by not quite knowing what you're doing. What you'll discover will be yourself." 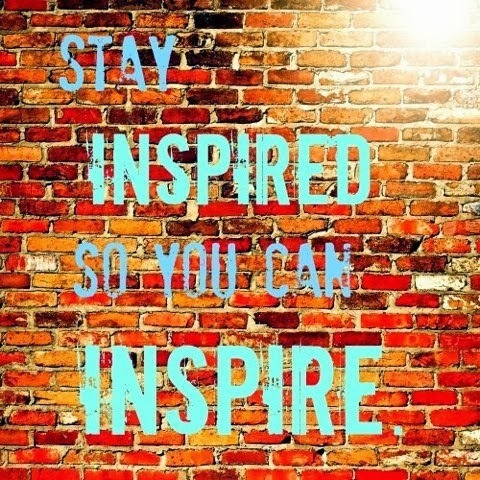 Teaching like an artist largely involves the habit of staying inspired so you can inspire. And the heart of that is getting ideas, making them real and seeing how far they go. It all starts with getting an idea that's good enough to pursue. Someone once said the only way to get good ideas is to have lots of them. Most ideas aren't good enough, so quantity is the key to success. How do you keep coming up with them? Well, I think the trick is really to just be more aware of them. One time we had a local author speak to our students and he said something I always remember--Ideas are like air. They are all around us. Once you start looking for them, you'll find new ideas for lessons, new approaches to your your biggest obstacles and fresh ways to breathe life into your work in everywhere. Again, most will be rough and most likely not good enough. Most will already be too similar to things people have already done. Don't be discouraged, though. Seeing ideas is a habit. Keep at it. The best advice I can give anyone in their creative pursuits is to keep a notebook or a file where you write down all the ideas you have. Do you want to blog? Create games? Write songs? Whatever it is, get a place to store your ideas as soon as you're done reading this post. When I made games I would write my ideas on any slip of paper I found nearby. If I saw paper, I started thinking about games! I was always writing down ideas or fleshing out ones I started previously. I made up a lot of cards for party games when my students were taking tests. At some point I started compiling the notes in Notepad and then eventually Word document on my computer. It was around a couple hundred pages after a few years. When I was home and I had a chance to work on games, I'd scroll through the document and add a thought here or there to my notes. I'd keep a few active designs near the first pages of the document, but all those other ones, even if they were abandoned for good reasons, were still there if I cared to go back to them. Every great act starts with someone who has an idea and acts on it. Get in the habit of finding ideas. See how far they go. Learn from the success and the failure. Tell the stories. Eventually you'll find a place to shine. it might be only a dim light or a bright flash. But it will be unique, in a place and in a way that no one else could. Last week I wrote about how I made a poetry slideshow with the free apps Pixlr Express and Videolicious. It's a great method, but I wanted to show an example I created with GarageBand and iMovie for iPad. Here's my example. I recorded the narration first. Then I created the music by just playing four chords on the guitar and strings Smart Instruments in GarageBand. Smart Drums were added too. I exported it from GarageBand and imported it into iMovie to add the images. iMovie gives a lot more control over the pan and zoom features than Videolicious does. This is the same haiku I used in the example in my previous post. And here's a quick tutorial I made to show the steps I used in iMovie. Last summer I was on a mission trip with the youth group from my church. We were in a small city in West Virginia working with poor children. Of course, I had my iPad with me. I was showing an art program to some young girls and they were making pictures. These other kids came up and asked right away what they were playing. Just like in school, when there's a computer nearby and five minutes to kill, most children see the computer as an entertainment device. Some see it as the tool that shortens the gap between dreaming and doing. I try to open their eyes to that possibility. People tell me their kids are good with technology. Kids tell me they're good with technology. I like to ask one simple thing - what do they make with it? No matter what it is you want to do with your time, digital technology is the tool that can help you do it better. If you want to play, sit and stare at mindless entertainment or just chat with friends, you can use technology to do it in ways that were never before imagined. 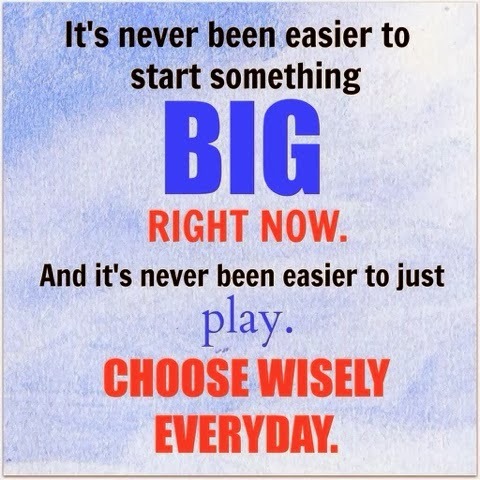 Whatever you want to do, you can do it big. Now more than ever the future belongs to those who want to dream. I'm working on one of my P^3BL sessions this weekend. One possible project from attendees will be a poetry slideshow. I made a very short example with two of my favorite free apps for the classroom: Pixlr Express and Videolicious. First, here's the example I created. 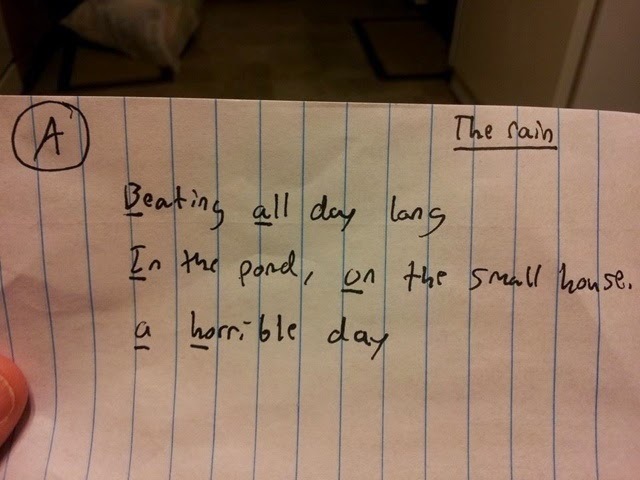 I wrote a simple haiku as a sample. It sums up how I felt as I watched some nice weather go by on spring break while working on this session! The pictures were edited in Pixlr Express then I used Videolicious to make the slideshow and add narration and music. My wife read the poem. You can see I added text with Pixlr Express to the first picture. Other than that, I didn't do a lot of editing. The overall look was achieved with the Silk Stylize option. It's in the Adjustments menu (not Effects as you might expect). Videolicious is a great app that strikes the perfect balance between simplicity and control. It will only make videos that are a minute or less, but for a quick story or a video slideshow like this, it's wonderful. Here's a tutorial I created last year for a different project. It uses a previous version of the app, but the steps are the same. I refer to an Edit option after selecting the pictures. That allows the user to indicate where the app will zoom on the picture. (Otherwise it just does it randomly from what I can tell.) I don't show how to use the feature in the tutorial, but I did use it on a few pictures when I made the short video. It is possible there's only one type of crazy and maybe all that varies between my labels is the degree. Perhaps each could be measured in terms of the number of people we are comfortable expressing the insanity to. Would I talk about it to my wife? My wife and kids? My friends? Would I say it in front of my church? Would I tweet about it? At any rate, I want to address the first type briefly, and that is the most mild of the three. It's the one we are most likely to flaunt. We might be a bit proud of it. We're almost certainly not ashamed of it, at least not in the individual manifestations. It's found in the out of balance (according to the normal people) priorities that allow us to make our art. It's how we find time when everyone else says there's none to be had. It's what we give up or take on that the rest of the world would never do. While I would argue we all have the potential to be artists to some extent, it's clear most of the world isn't doing it. At least they aren't consciously. So, for those of us doing what it takes to make art, we necessarily have to make different choices with our time, money and other resources. The better and bigger our art, the more pronounced these differences are. They leave the normal people shaking their heads. "I could never do that," they say. One example of my apparent insanity is the fact that I don't watch television. I grew up watching quite a bit of it and I enjoyed a lot of shows. I'd say I watched rather intelligently. I certainly learned a lot from those hours of viewing about stories, real life events and the art of making a movie. But when I was doing my student teaching I got too busy for television. I quit watching it for three months and I never went back. When I do have to watch it now, I'm terribly bored with almost any of it. It has worked well for me these past two decades, both in expenses of time and money. I often forget how strange it is to others, particularly students, to find out I don't watch it. I do own an old television, but it's not even hooked up to get a channel. This has amazed many a teenager. It's craziness. And it's just one example. Think about what you've given up or taken on to accomplish your art--your contribution. Sometimes we don't really think of them. The craziness is that it's normal to us. So acknowledge the sacrifice is not to pat ourselves on the back, but if we're going to help others take the next step in their journey, we need to be aware of the costs, even if we've paid them so long they don't feel like loss. Being aware of and comfortable in this fairly acceptable type of madness (i.e., uniqueness) could help us with the more drastic forms I'll discuss later. At times in a long pursuit of a vision, the weight of even these small oddities can add up. I have seriously questioned the wisdom of some decisions that, at the time felt worth it, but later looked like quirks that merely distracted me from whatever the rest of the world is enjoying. In those times of doubt there is no way to know. It has helped, though, to be thankful for the craziness. Perhaps quirks, shortcomings and ignorance steered most steps, but thank God for the moment to be there. When all the rest of the world wonders, it is because no one else (humanly speaking) is in that exact same place us. None could be and in that there is a gift. In making art, we too are being made. I can't explain this well, but I have found the peace that comes from resting in the gift of uniqueness. One of my original 6 ways to teach like an artist was to notice what you love and love it out loud. The point was not to necessarily try to make the students love the same things, but to let them know the joy of really throwing yourself into a passion. I know, for example, that I talked about my love for music a lot. Students knew I played various instruments, always wanted a band and that I played in the worship team in my church. A common love for music was a great conversation starter with many of them over the years. I also used it for many examples when it came to following dreams and keeping a creative hobby alive on the side. But I was thinking recently about how much I love reading, yet I never got as passionate about that when teaching. I'm not sure why. I used to work with high school students when I taught in the classroom. I remember talking about books I read. I'm mostly into non-fiction. I'd use them as examples many times, especially in the class where I taught about setting life goals and career planning. Still, I don't recall a single time I expressed my enjoyment of being lost in a book, finding a common bond with a writer or being grateful to hear the author put thoughts into words in ways I couldn't. I now work with many teachers in all grade levels. It is very common to hear a female teacher in elementary grades rave to her class about a fun book they just finished. Just looking back through my experiences, I can't recall a time I heard male teachers do the same. And I remember hearing very little from any high school teachers about loving to read. Only our library is clearly into reading. The same teachers are passionate about their favorite sports teams, hunting, cooking or their families. I wonder why we have not been as passionate about the joy of reading. I wonder what a difference it would make if we would start. When I'm showing examples on my iPad, refer to my Kindle app and library. Bring up reading to more teachers. Maybe with some shared interests we could start a book club. I love reading interviews with artists. Even when I don't like their art, I find it fascinating how they think. A lot more reflection and work goes into what they do than what I'd expect. With all their skill and practice, they make things look easy. But art is hard work. That's the really the message I see time and time again coming through. It takes a ton of effort to make good art. Interviews with artists make a great starting point for lessons. Students love to read about their favorite musicians, actors or even game designers. Take a broad perspective on who qualifies, have them look up some interviews and get to the bottom of things like their style, their voice and their passions. In groups, have them discuss what the artists have in common and what makes them unique. Write two things you'd love to experience from the artist's life and two things you're glad you don't have to. Make up questions for the artist that were not asked in the interview. Based on what you did read, how do you think the artist would respond? Why? Did anything in the artist's childhood come out that is similar to your own childhood? How would you describe the artist's style, voice or passions? What does the artist's answers in the interview tell you about the amount of talent and the amount of work it takes to succeed? Give examples. Since it's National Poetry Month, I played the Haiku Game with the family (my wife, 15 year old daughter and 13 year old son) tonight. It took one round for them to get the hang of it, then we went live on Facebook with our poems for the second round. We picked a random topic with the help of an online topic generator. We also drew six letter tiles from an old word game. The first line must contain words that begin with the first two letters, in any order. The next two letters are for words in line two and so on. We drew an X and tossed it back, so be flexible on letter draws and even the random topics unless you are playing with an insanely creative group. Of course each player's poem must make a haiku in the form of five syllables, seven syllables and then five. Our topic was something about how weather affects moods. The letters were A, B, I, O, H and A in order. We took around five minutes to craft our haikus, then read them to each other. It's always a fun exercise once everyone realizes there's no pressure to be perfect. The usual game requires one player to sit out on writing each round, then he or she picks a favorite from the others. 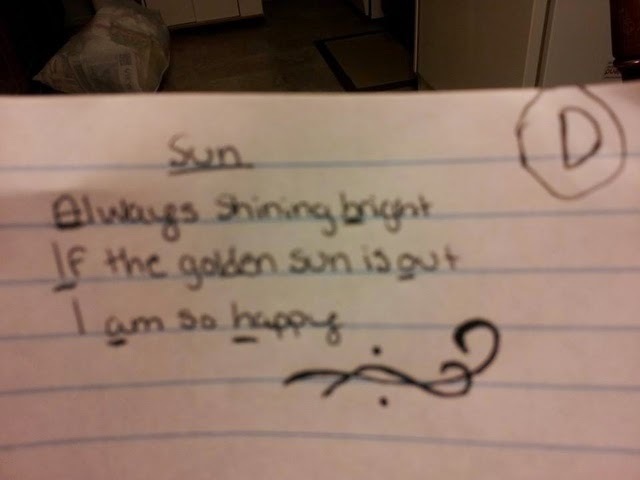 We decided tonight we'd post the poems on Facebook and have our friends vote. Here are our poems. The results are not in yet on a winner. I love learning, at least most of the time. I spent 18 years of my career as an educator hoping to make my high school students love learning. Now I've given up on that goal. I had to admit something that, for a long time, I didn't want to admit. For most people, even those who are very successful by common measures, they do not primarily love learning. They love doing. That is, there is something they love doing and in order to do it more often or to do it better, they willingly take on the work of learning. I finally admitted this and gave up my "do it for the love of learning" battle cry when I was preparing a PD session on project based learning. The moment of truth was when I realized most of my personal learning, across many areas, stemmed not from a desire for new knowledge, but because I was trying to do something that was important to me. Sure, I generally liked the learning. I found it rewarding, but that in itself was not my goal. Furthermore, some of the hardest, most important lessons were the ones I dreaded the most (like everything I learned from sticking with a job that frustrated me for 14 long years). Now lest I sound heretical as an educator saying I don't care about fostering a love of learning, let me point out that learning is, itself, doing. It can be the very "doing" that provides the reward. I think that is true of almost all young children as they set out and discover a world filled with new things. That's great and I don't want to take that away. But can we admit for most people that isn't enough? At some point, for a thousand different reasons, most people grow tired of learning just to learn. In fact, I've come to appreciate the vast number of things we as humans can find to do passionately. And as such, each is potentially a huge opportunity for learning. So in the end I have this: My job as a teacher is not to make all my students fall in love with learning. It is to find what they love (possibly by helping them find it first) and then design important learning experiences around those passions. There is nothing easy about this. In fact, with some important skills it might be impossible to link it to a narrow interest a particular student might have. I've found it to be an exciting challenge, though, and early signs of success have been inspiring! For a year and a half I taught a class to high school seniors about careers and college. (I always felt it was a little late to be doing this with seniors, but that was the task before me.) It was a welcome change of pace from my usual math classes, but even more than that, working with the young adults as they learned about and planned their very lives was a blessing. I created several lessons and activities throughout that time that helped students get in touch with their passions and goals. I would ask them what they want most for their future. So many times I'd get the answer that they wanted to live life to the full. I never doubted their sincerity when they'd tell me that. It's not like they just said it because they didn't want to give it any thought. Still, as a teacher I was not content with those words alone. They could mean anything, really, and I wanted to push for something deeper. I also wanted to better answer the question for myself. I know that, to some extent, a full life would look different for each of us. That's the beauty of being human. Still, wouldn't it be of some benefit to get closer to the heart of what it means to be fully alive? At least we'd have a target to aim for when it felt we were off or when big decisions would come along. Just because it's difficult to pin down doesn't mean we shouldn't try. In listening to the students, dealing with my own longings and reconciling all of this with my personal faith and life experiences, I formulated some thoughts that have been a guide to me ever since. I submit that a full life consists of enjoying the blessings and fulfilling the responsibilities that one has been given. It is twofold, though we so often forget the second part. I know students were quick to forget it. When I listened to them, a full life looked like a lot of fun, a lot of spending and a lot of "sucking the marrow" from life. But I believe that's only half of what could make us fulfilled. We also have to find what we are supposed to do and give that all we've got. Some would point out that finding one's place is also a blessing, and I suppose there is often truth to that. I don't always find it to be the case though. Sometimes there is a responsibility that is just plain old work. A blessing may come in time for doing it, but if we are only looking for the gift or reward, or turning away when our reasoning doesn't reveal the possibility, we'll miss so much of what it means to be alive. When it comes to me as an artist--one who gets big ideas, brings them into reality and shares them with others--my biggest success would have to be my work as a game designer. For fifteen years I poured myself into the art of game design. I wasn't so much into computer or video games, though I made a few simple ones. Mostly I worked on traditional board and card games. Many of my creations didn't go far, but I had a couple party games that trickled around the planet, making life a little more fun for thousands. Players supply the best part, which is the creativity that breathes life into the play. In 2008 the school district where I work purchased interactive whiteboards and classroom response systems. I saw the possibility of using those tools to adapt our creativity game into classroom presentation games. That way a large group could enjoy the fun together. Those games play sort of like interactive TV game shows. I've written extensively about the games and posted examples on my other blog. See the links at the end of this article if you are interested in those games. For purposes here, I just want to talk about the simple concept behind the games and what it offers. In our creativity game system, players were presented with two random items and from that they would make up creative responses. One player would act as a judge and pick his or her favorite responses. For example, in the riddle game (eventually published as Why Did the Chicken...?) players are presented a riddle starter and two random nouns. It makes silly questions like, "Why is Santa Claus afraid of Einstein?" Players compete to give the best answers to those riddles. The concept of the prompt was that simple--just pair two random things--but the results were astounding. I still can't believe the number of entertaining hours I have enjoyed with friends as I put different shells over that basic skeleton. Creativity happens when we make connections between seemingly unconnected things. It actually becomes a connection between the things themselves and the person's experiences. That's the beauty of it. At their most creative, no two people form quite the same connections because no two people have the same experiences. That is how life shines through and art is born. I eventually turned the games into some creativity exercises and I built a presentation around them. 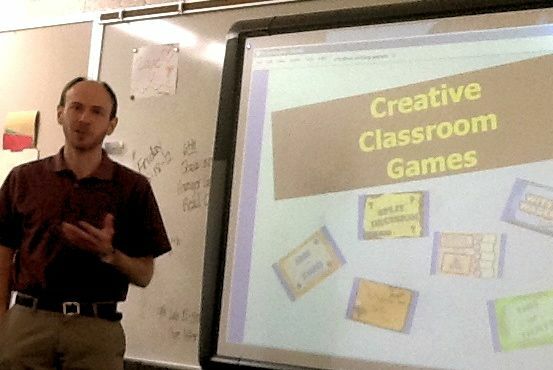 I shared the presentation with classes in my district and I posted a version on my Classroom Games and Tech blog. It has been my most popular post by far. I learned a few very important things in sharing that activity with students. 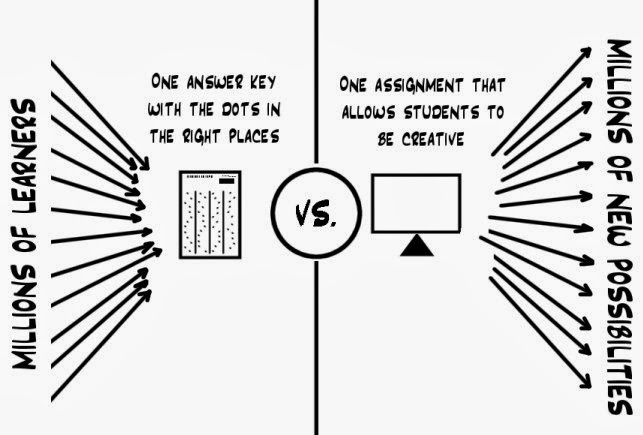 As we've been told by Ken Robinson and others, many students do not believe they are creative. There are skills for creativity that can be taught. My simple exercise of just pairing random items in a riddle and making funny responses is just one example. And the best thing is that people can learn to be more creative. Just practicing that simple exercise brings out fun and surprise for the students I've worked with. Comments I've received on feedback surveys indicate they liked practicing creativity and they plan on continuing to practice it. I usually take one class period to give my presentation, introduce the exercises and then play some games. It can be done in smaller pieces too, though, so I encourage all teachers to look for ways to introduce such concepts and exercises to their students. As I often point out, we don't grade on creativity in most classes. Still, it's like oil is to a machine. Oil is not the goal of the machine, but without it the system begins to wear down. Anyone teaching secondary students can see the school machine coming to a standstill for many students and I believe lack of creativity is one big reason why. Hopefully we can all do our part, possibly through simple, fun games and exercises, to infuse a little more life in the system! A summary and some videos of the creativity exercise and game presentation I give - This is my most popular blog post. An article and video about the creativity games themselves - This includes classroom versions and traditional "party game" style versions you can play with paper and pencil. A generic version of my Classroom Creativity Games - A version for the whole class of a few different takes on the creativity system. A computer version of Why Did the Chicken...? - A good pass-n-play version for a small group with a laptop. I know it's common to make room for "voice and choice" in class activities and I've heard it as a requirement for project based learning. In my own project designs, I like to take that a step further and emphasize those elements as part of the learning, both in planning and reflection. I call it P^3BL--passionate, personal PBL. Passionate means there's something present in the project that the students put their heart into. They care about it and the expression is apparent to anyone who sees the project or presentation. As an example, the teacher's at my son's school made a new requirement for science fair projects this year. Students had to base the project on something they were passionate about. It made an amazing difference on the variety of projects that filled the gym. It was interesting seeing the creative ideas students explored. I also can attest that it was a lot easier getting my 13-year old to complete his own project this time around, even though the subject (computer programming) was a challenge for him. Personal means there is at least some element of personal style present that no one else would have, or maybe could have, done quite that way. Personality and experiences come into the mix in fresh ways. Note that these are emphasized in planning and reflection. 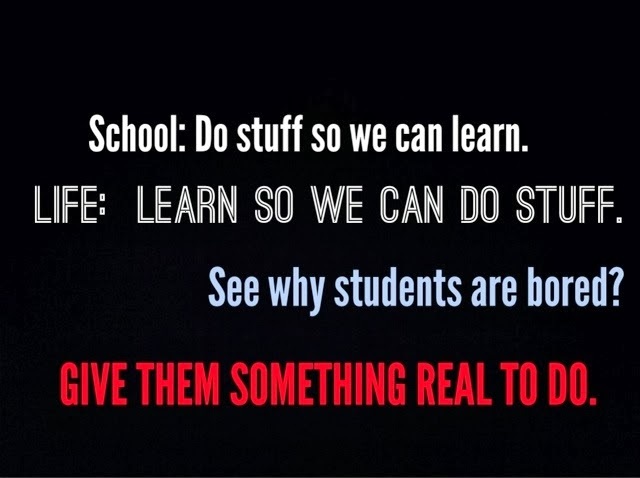 Students need to build them in. As a group they need to make sure each group member will have elements they can point to. And in reflecting on the project afterward, students must point out the elements that fit these criteria. My hope is that they will also find some things (or others will point things out to them) that they didn't plan for or notice themselves. At some point I started turning the things I say regularly at school and my more popular Tweets into the little word posters we see plastered all over the internet and social media. I compiled the best ones (including all of those below) in this post on my other blog. The ones below relate to the idea of teaching like an artist. They focus on inspiration, creativity and the importance of making things. Please feel free to share or use them as slides or images for presentations. A link to my blog or my profile on Twitter is appreciated. Here are the ones directly related to my teaching like an artist theme. Artists dream big and do what it takes to make the dream real. They are motivated by letting their ideas spread and they love to share the ideas with others. School needs more of these people! Too often we forget that technology allows us to connect and to do something big now. I know students don't think of it much. They are bombarded with free entertainment instead. The chance to do something big now is why I'm not big on talking about career planning or getting a high paying job someday. 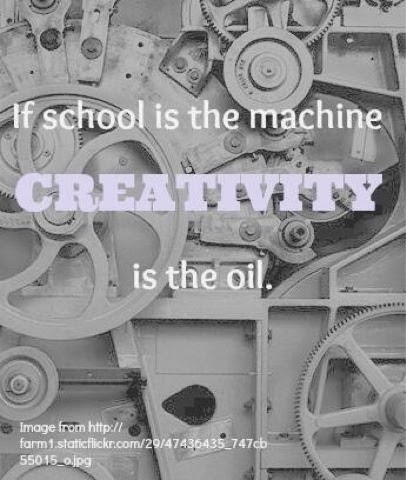 This picture that came to mind when I discovered the power of creativity in school. It has received a lot of attention in the years since. 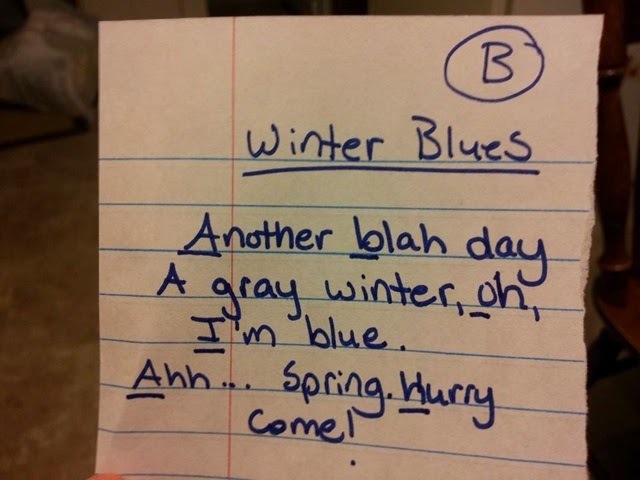 We don't often grade on the creativity and it's not on the list of learning objectives. That's fine, but that doesn't mean it's not important in all grades and subjects. 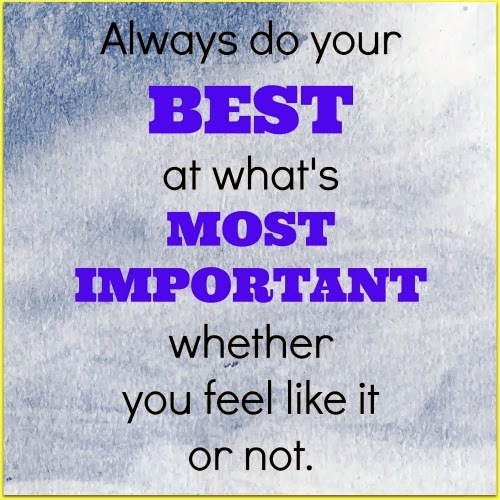 This is the key to success I always taught my students at the start of a school year. It's no wonder the students get bored with school. We all are wired to learn so we can do. Focus on the doing and design it so learning happens. Don't forget it's not about the tools. 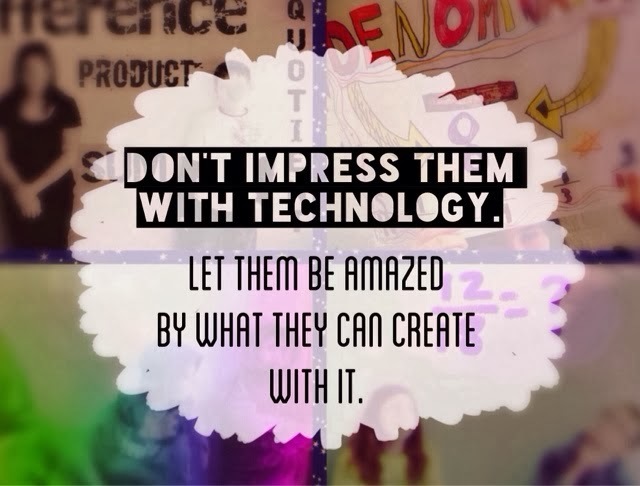 Let students be amazed with what they can accomplish. The path of an idea, from initial vision to what it becomes in reality, is central to what I call art. While we usually think of a work of art as some inanimate thing, constructed in a relatively short period of time, are not our very lives an ongoing work shaped to a large degree by our ideas and our attempts to make them real? We make our lives as we pursue a vision of what we want it to be. Within our lives we find many other smaller works, one of which could be our careers. 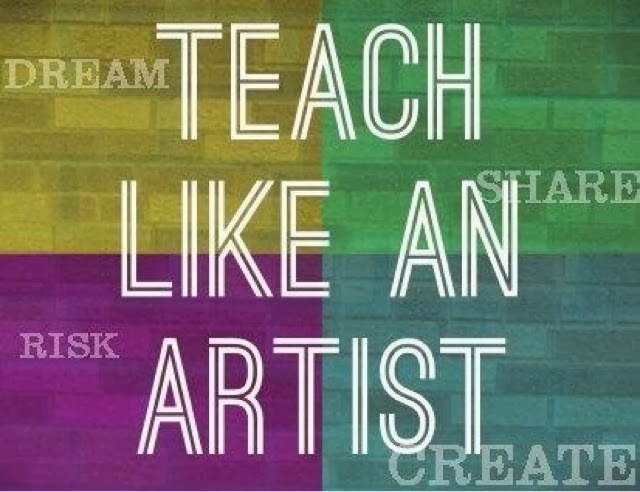 In fact, teaching like an artist might be nothing more than examining ourselves and our job as art. We must consider what we make through our work and how our work is shaped in return. In this way, I find it fascinating to talk to teachers about when they first realized they wanted to teach. When did we get that initial vision that we could do this job? When did we want it badly enough to start making it reality? How did that change over time? I had several false starts in my own journey to become a teacher, each with it's own lessons. I remember well the night I finally relented and decided to start in the teaching program. Knowing what I do now about the profession and my performance, it seems like a terrible idea looking back, but here is how it went. I was in a job I didn't enjoy and I just had another letdown with my ever present dream of having a band. I was lying in bed, sleepless and frustrated. I wanted to do something more significant and teaching came to mind, like it did other times in years past. It wasn't that I cared to teach math or really any particular subject. Instead, that night I was feeling my friends had given up on a dream to play music. I got the idea that through teaching I could help teenagers pursue their dreams. I saw math class as something students would have to work through even though they hated it. As such, and as stupid as this sounds to me now, I imagined that could be a perfect example for them of working through obstacles in pursuit of a dream they really wanted. I'd have a talk with my former self about that idea if I could. There's so much wrong with it, so much more to what the job really entails. Yet at the same time I would not talk myself out of the decision to start in the teaching program. That's enough of my own journey for now. What was your initial vision like? In both books Godin repeatedly challenges the reader to get started, make things and keep getting better at making them. 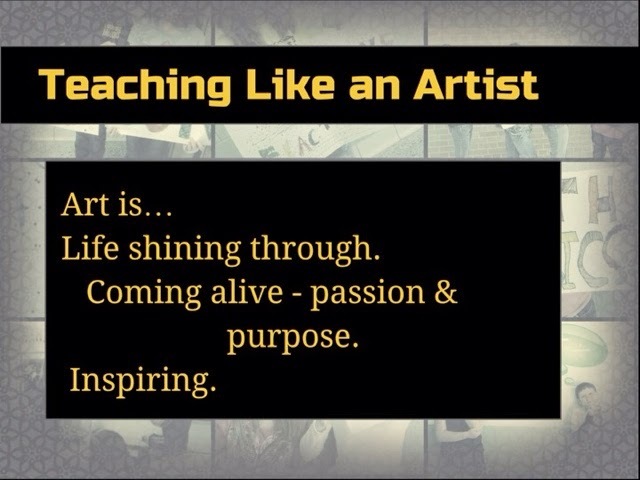 I started consciously putting that into practice a year or so ago and I've been encouraged by the results, some of which are these thoughts on teaching like an artist. Last year I wrote a draft a Lifelong Learner Challenge based on some of the principles of the books. I'm still shaping it, putting it more in the language consistent with the other things I have on this blog. In the meantime, here's my updated draft. Inspired by something I read - This implies regular reading, preferably from a book. Give credit throughout the project. New - It must be new to me and to the world--original. It must stretch me creatively or otherwise. Good - It must be measured against a realistic, high standard identified in advance. Personal - Those who know me can see me--my style, unique preferences or personal experiences--in the work in some way. Helpful - It must be presented or published in some way so others can find it (or what I learned from making it) and benefit in some way. How did the final project measure up on the stated standard of measure? Where do I still have room for growth? What surprised me most in the project (in good and bad ways)? How did this project change me? Is it worth it to do more projects like this one? Why? If you do something similar or have suggestions, please share them in the comments or by email. Artists do the work required to bring their vision into reality. They often make it look easy, but that's because we didn't see the thousands of hours spent practicing, making mistakes and learning what doesn't work. Success is on the other side of a big old mountain of work. What's more is we probably can't even see the whole mountain or the other pitfalls waiting just over the peak. I have worked with a lot of teachers to help them do exciting projects using technology. Those who resist using more tech always have a string of reasons why they don't use it more. It let them down once, or maybe just the fear of that keeps them from moving ahead. All my hours working with the tools certainly makes some of the usual hurdles easier to get through, but I don't disagree with those who say it is hard. 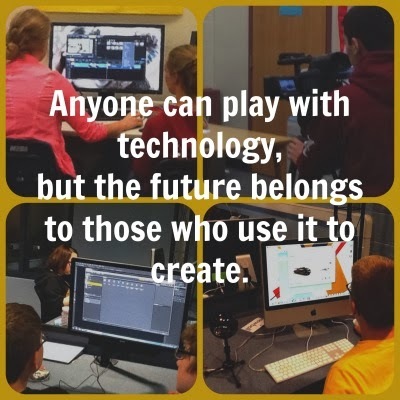 In a traditional school setting it takes more work than most realize to make creative tech projects work out within the system. To make any worthwhile idea into something real it will require us to push through more than we know. There's more dull routine, more battles for time, more negative emotion, more fear and more rejection than we expect. If we don't really want to do it or if we lose sight of the purpose, there will always be a handy excuse nearby. And who would blame us for quitting when all the others have given up their crazy dreams and settled for "realistic" long ago? If the work matters, expect opposition. It will be up to you, though, to decide if that opposition is simply an obstacle to work through or a good excuse to back out. This article originally appeared on my Games and Tech blog. I made some minor edit is when I copied it to here. Not every artist would say she needs to know her audience. The purpose and form of the art probably makes a difference. I remember reading a recent interview in Rolling Stone with Bob Dylan. He said something to the effect he never wrote for anyone other than himself. Some artists can get away with it. But I remember how valuable the question of audience was when I was making games or helping other game designers. Any problem or uncertainty throughout the design process was immediately put in focus when we asked ourselves who the game was for. On the other hand, confusion resulted when the vision of the target audience was poorly defined. I see a similar problem in school. When teaching like artist, who is the audience? I'd think the obvious answer is the students. 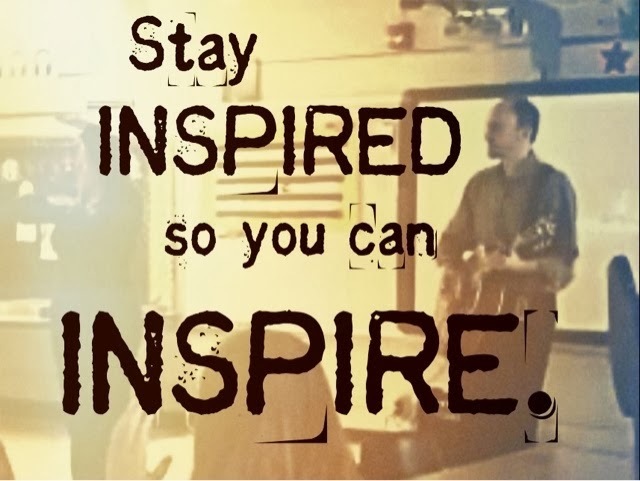 In a sense, we'd like to perform for them--to share and connect--in hopes of inspiring them. They are the ones coming in daily, seeing our work and walking away with something of value. But all too often school loses focus because we are bringing the students along on a different show planned for someone else. It feels like we're putting on a performance for the state--a play practiced for months and months, shown to a faceless crowd in hopes of a good review. And then there's another big show next year. We prepare students to play for a vaguely defined employer, one who will pay their bills in the future. Day after day we rehearse our lines. The best students, even in elementary school, know they're getting ready for this person they might meet more than a decade down the road. They answer questions about why with memorized responses--"Math is most important because you use it in any job." The heart wins out, though, and study time is easily overtaken by the endless stream of more interesting options. I see students going through the motions for so long they forget what they're really doing it for. Learning turns into routine. Check off the list for the minimal requirements and get the credit. What if the teacher modeled a passion for life and learning that inspired the students to do the same? Is it too idealistic to think students could care so much about their work, and that the teacher designed it so skillfully, that they learn what they need to along the way? Maybe those big tests, important as they are in the process, could be more like an art show where the public sees one presentation of all those individual works. To be sure, school is multifaceted. It takes most of a year to get through. For the teacher acting as an artist, there is enough opportunity to have more than one performance or reason for performing. There will always be those days when it looks like a rehearsal, with everyone practicing for that faceless audience. But it gets boring for the students when school done that way wears on and on. Standards matter and the tests have their place. Obviously we are there partly to prepare the students for the world of work. But those things are not enough. We know this because we know so many students sum up the second half of their time in school with something equivalent to the word "boring". Somewhere around fifth grade, little by little, we stop reaching the intended audience. Then eventually many of them stop coming to the show. This happens whenever we let the standards and pacing guides become an excuse to we can dodge the real work of our art. On the other hand, we know there are teachers getting the job done and infusing some life into the system at the same time. None of them say it's easy. I never hear a hard working teacher say the pay is worth it or that the principal gave them enough time to complete the project. They just follow their vision, develop their talents and and play off the energy of the crowd. 1) Write down your ideas--all of them. 2) Work at one until it's done. Do what it takes to bring the original vision into reality, no matter how differently it looks at the end. 3) Share. Don't just share the finished product, but tell about the experience and what you learned. Even if it didn't turn out well, find the lesson. 4) Repeat. Keep doing this so you get better at each step. Repeat until you've found a voice, a place or the people who need what you can give. Art is life shining through and the artist is someone who gets good at letting it. When life shines through, it catches attention. Artists raise questions. From where they stand, they see what others don’t. They express thoughts and emotions in surprising, new ways. And if they don’t ask the questions themselves, they lead us to a place where we must do the asking. To learn is to realize there is more to learn - that there is much to wonder about. Deep curiosity oozes interesting questions. What questions did I raise for my students today? What questions did I inspire them to ask me, themselves and others?